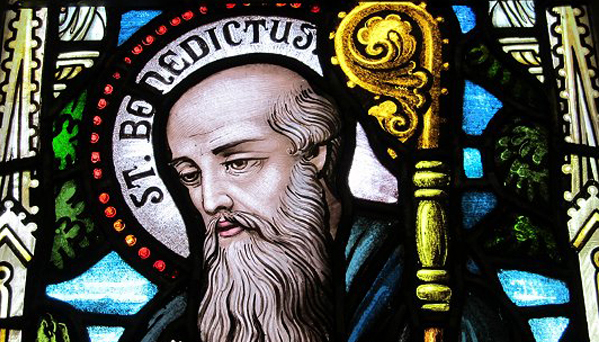 Glorious St. Benedict, sublime model of virtue, pure vessel of God's grace! Behold me humbly kneeling at your feet. I implore you in your loving kindness to pray for me before the throne Of God. To you I have recourse in the dangers that daily surround me. Shield me against my selfishness and my indifference to God and to my neighbor. Inspire me to imitate you in all things. May your blessing be with me always, so that I may see and serve Christ in others and work for His kingdom. Graciously obtain for me from God those favors and graces which I need so much in the trials, miseries and afflictions of life. Your heart was always full of love, compassion and mercy toward those who were afflicted or troubled in any way. You never dismissed without consolation and assistance anyone who had recourse to you. I therefore invoke your powerful intercession, confident in the hope that you will hear my prayer and obtain for me the special grace and favor I earnestly implore (name it). Help me, great St. Benedict. to live and die as a faithful child of God, to run in the sweetness of His loving will and to attain the eternal happiness of heaven. Amen. (3) Our Father, (3) Hail Mary, (3) Glory Be St. Benedict, pray for us. God, the Holy Spirit, Have mercy on us.Holy Trinity, One God, Have mercy on us. V. Intercede for us, O holy father Saint Benedict, R. That we may be made worthy of the promises of Christ.